Brazil has been at center-stage for the past few weeks as the soccer (or futbol if you prefer) world cup has been played across the country. 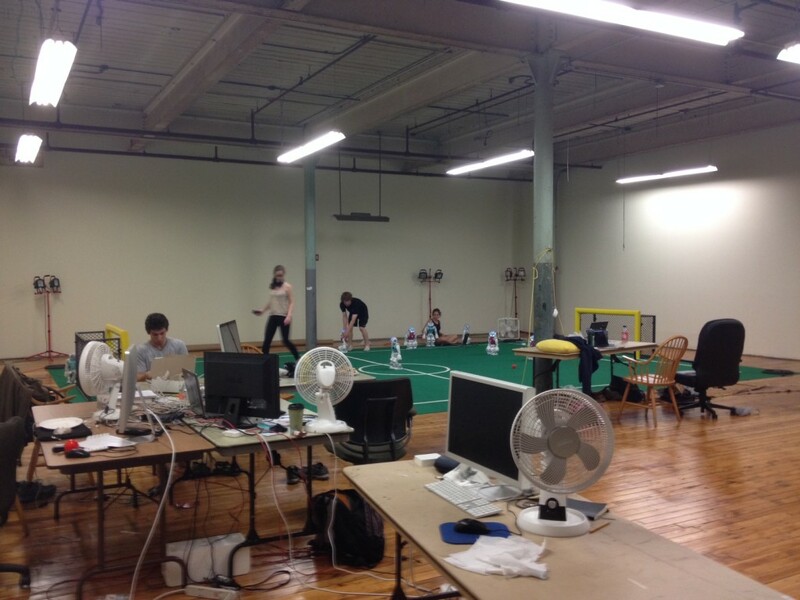 Well move over soccer, here comes ROBOCUP! The Northern Bites are going to Brazil baby! Tonight is the last night the Northern Bites have in our summer residence. Tomorrow with the supervision of Chowndawgg we will be packing up the essentials and moving all of the rest of our gear to Searles Science Building. We’ve spent the summer sweltering in the old shoe-repair shop in Fort Andross getting our robots ready for competition. Over the past year the focus has been upon improving our behaviors and features such as kickoff plays, a shared ball and roleswitching have been implemented. It was fortunate that we were afforded an extra month of summer to work as compared to last year because we had big plans, and they’ve come together! On Thursday morning the team will be departing Brunswick for Boston with a final destination of Joao Pessoa in mind. With the team this summer we have two seniors: Josh Imhoff and Daniel Zeller (captains); three juniors: Nikki Morin, Dan Navarro and Megan Maher (Newbies [though just barely]); and one bonus: Lizzie Mamantov (NorthernBum, Bowdoin class of 2013). Unfortunately due to reasons our coach and mentor Eric Chown (Chowndawgg) will not be able to join us. We’re very excited about the competition, and hope to do right by our old teammates who brought us to the place we are today (EJ: don’t worry about calls from Josh about loc, international bills are out of our paygrade; we’ll be in touch to get your skype username! NOT A JOKE). We’ll be keeping everyone up-to-date here on the blog, but more information about the competition can be found on the official website, along with game scores, standings and (hopefully) livestreams. P.S. Special thanks to Robocup friend Addie Brown who baked us some wonderful chocolate chip cookies to help us get through the long night ahead! This entry was posted in RoboCup on July 15, 2014 by Blog Admin.